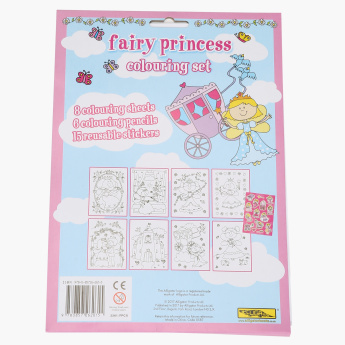 Fairy Princess Colouring Set | Multicolour | Kids will have loads of fun while coloring in the beautiful pictures and learning ABC in such an entertaining way. Ideal for gifting kids, this colouring set comes with colours, stickers and a colouring book. Sure to improve various skills, it will keep them excited and will help show their creative side. 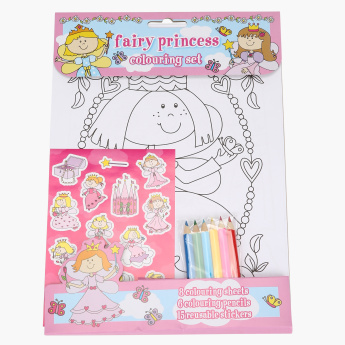 Feature 2 : The book contains 8 coloring sheets, 6 coloring pencils and 15 reusable stickers for endless creative play. Feature 1 : Kids will have loads of fun while coloring in the beautiful pictures and learning ABC in such an entertaining way. 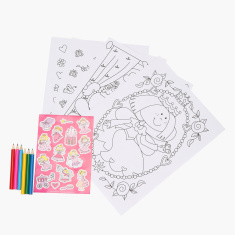 Feature 3 : Coloring activity will also help kids develop motor skills, concentration and coordination.